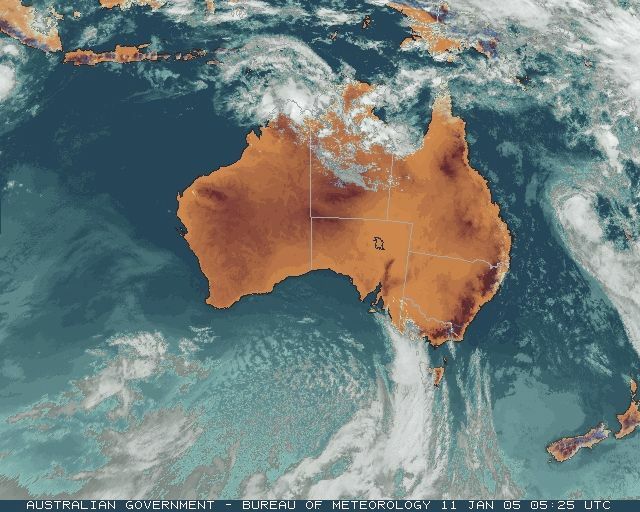 These images captured at 3.15pm CDT show the enormous extent and intensity of the firestorm that engulfed South Australia's Eyre Peninsula today. 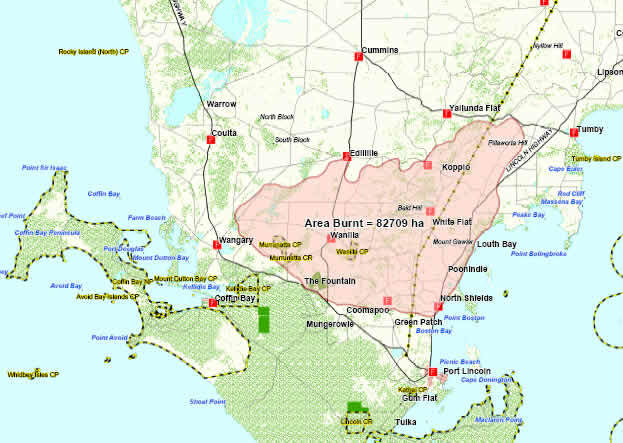 Red borders outline the hotspots, the largest measuring some 20km wide. 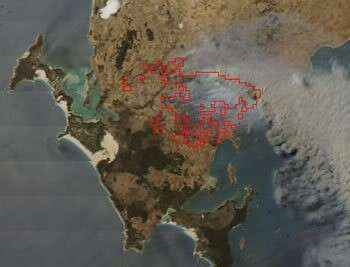 The updraft from the fires creates rows of pyrocumulus cloud more than 50km downwind in the smoke plume as it is blown across the foot of the Yorke Peninsula. 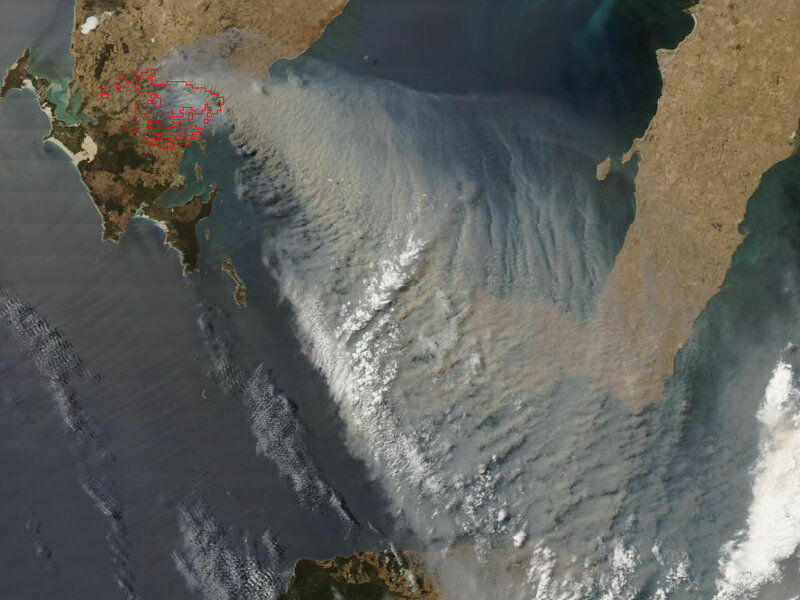 Port Lincoln is visible as a light grey-brown smudge below the main conflagration. 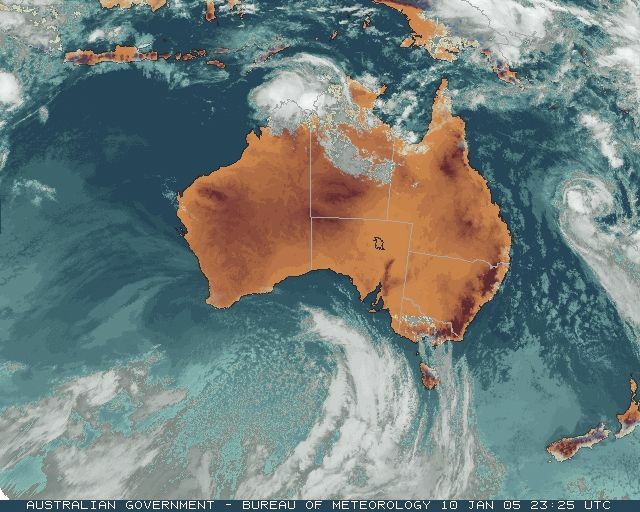 The combination of weather elements that firefighters fear most -- heat, low humidity, wind and dry vegetation -- came together today over South Australia's Eyre Peninsula. In a fire that burnt through 827 square kilometres (82,709ha) of the southern Peninsula, 9 people died and 113 were injured, 64 dwellings and about 80 vehicles were destroyed, and about 44,000 livestock, mostly sheep, perished. Some 400 Country Fire Service personnel, 80 appliances and water-bombing aircraft were involved in battling the blaze which is estimated to have caused over $26m in property damage with a high level of uninsured damage. The fire broke out of containment lines late this morning, and was not declared contained until around noon on Wednesday. Only about 15mm of rain has fallen on the southern Eyre Peninsula since the last significant falls in the first week of November, less than half the average for this normally dry two-month period. Today was the third day in a row -- and the worst -- of hot, dry and windy weather with a northerly wind freshening ahead of a cooler change that crossed the area in two instalments, first a wind direction change late morning then a further wind change with the cooler air late afternoon. Cleve, to the northeast of the fire zone, has reports that are representative of conditions over the area over the past few days -- the AWS at North Shields was knocked out by the fires and provided no data today. On Sunday, Cleve's maximum temperature was 37.1 with daytime humidities around 12% and mostly N to E winds gusting to 46km/h. Yesterday's figures were 41.2, 7% and variable winds gusting to 50km/h. 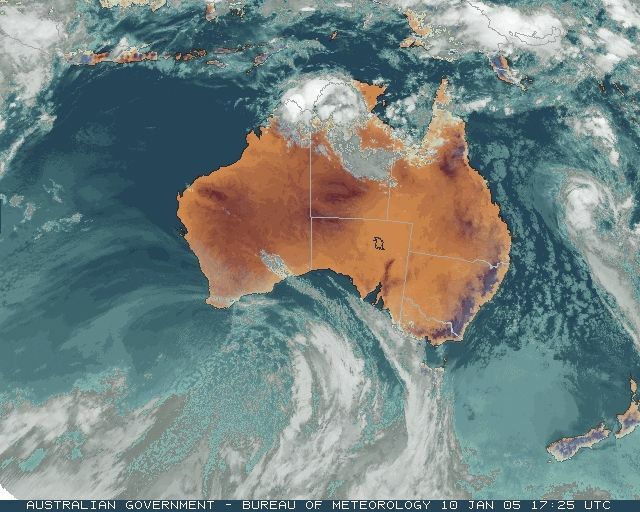 Today's figures were 43.5, 9% and northerly winds gusting to 70km/h around 1pm, turning westerly with the first wind change then southerly after the second wind change. This SA CFS map shows the area burnt as at 10am 13 January, and locates towns mentioned in the report. The fire began on Monday, caused, it is believed, by the hot exhaust system of a car that was driven through long grass near Wangery. The fire was contained that evening but broke out again about 10 this morning 6km NE of Wangary. About 13 SA Country Fire Service appliances and over 180 CFS volunteer firefighters were at the scene of the fire when it jumped containment lines and headed south after burning through about 1,800ha. In the extreme conditions they were powerless to do more than issue warnings and take defensive measures. The fire burnt rapidly to the east and southeast in a 70km/h wind, the mostly flat to undulating terrain and scrub, grass or grain crop vegetation offering no resistance. Shortly before 1pm, the CFS warned residents of Wanilla, North Shields, Poonindie, Louth Bay and Greenpatch to implement their bushfire action plans, while those in the last three hamlets were advised to relocate to the beach as a rescue point. By 3pm, the main front was moving toward the coast between North Shields and Louth Bay, but the wind shift was driving a second front NE towards Edillilie, and water-bombing aircraft were assisting. 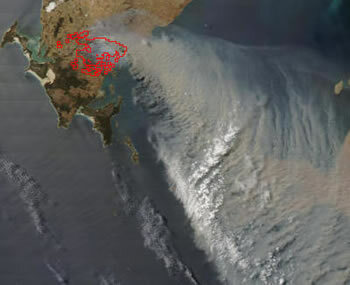 By late afternoon, this second front was in the Koppio area, continuing to burn NE towards Tumby, and by late evening the most intense fires were engaging 250 firefighters south of Yallunda Flat, while the eastern firefront was easing in intensity or had burnt itself out at the coastline. Milder conditions and a drop in the wind overnight allowed crews to create containment lines around the main front from Koppio to Yallunda Flat. Additional firefighting resources arrived overnight from the Flinders and Mid North areas, with a further 50 CFS personnel arriving from the Adelaide Hills and Barossa Valley during Wednesday. Steep terrain and dense vegetation made this area more difficult to manage, but the fire was declared contained at noon on Wednesday. Mop up operations continued for the remainder of the week. State Emergency Services Minister, Patrick Conlon, told Channel 7 that the fire was the worst, in terms of casualties, since the Ash Wednesday fires of 1983 when 28 people perished. Eight of today's victims died in their cars trying to outrun the flames, 5 in two cars near Wanilla and 3 in one car on the Port Lincoln Highway at Poonindie. Mr Conlon said "It has moved faster than any similar sort of fire that we have had records of. That is why, tragically, it has caught some people fleeing." The ninth victim perished in a North Shields home. Four of the dead were children. North Shields resident Russell Puckridge told ABC radio "We had about three minutes...from the time we seen it [until] the house was gone. I was sitting in the car underneath the carport there and next minute all I seen was 20-foot waves of fire coming up over the hill. I didn't even have time to grab a pair of thongs, mate." He got his wife and child to the safety of the beach, but when he returned home, everything was destroyed. Country Fire Services chief executive Euan Ferguson described the event as a classic fire storm. "There is no force known to man that can control a fire burning under those conditions," he told the Herald & Weekly Times. Much of the hamlets of North Shields and Louth Bay appear to have been wiped out, with many residents escaping to the beach, into sea caves or into the sea and at least six having to be rescued from the water by SES boats. One half of the Port Lincoln Caravan Park at North Shields was spared, the other half including 15 caravans and cabins was razed. Much of the lower Eyre Peninsula was cut off, with the Lincoln Highway closed today and Bratten Way closed between Tumby and Cummins until Wednesday. Refuge centres for fire victims were set up in Port Lincoln and Cummins. Power and phone access were cut in the fire area, and over 1,000 properties lost power in Cummins. The fire burnt around the Port Lincoln airport, located at North Shields, but did not touch the terminal or fuel depot. A concern of farmers following the fires has been the drift of ash and topsoil from burnt areas into adjacent paddocks, reducing feed available for remaining sheep and cattle. With communications across the lower Peninsula in disarray, police and volunteers have had to visit all properties to ensure that no people or animals are in distress. Water supplies were reinstated within a few days of the fires, but electricians faced a long job of checking properties partially damaged to ensure their safety before power could be turned back on. Fears were held for critically endangered native species, especially the rare yellow-tailed black cockatoo which were nesting and had chicks in breeding hollows. However, sightings of the birds in the weeks following the fire, including a group of 15 to 25, in the Koppio Hills was heartening. The Mayor of Port Lincoln, Peter Davis, told the Port Lincoln Times that only the fortuitous timing of a wind change saved Port Lincoln from a major catastophe. He said "Had the wind stayed northerly, and had the wind changed 10 minutes later, Port Lincoln would have been burning...[and] the losses would have multiplied many times. The fire would have come through Coomunga, then over Winter's Hill and into town. All that is unfirefightable territory with masses of prickly acacia, which would have gone up explosively." It took 9 days of activity by firefighters, extinguising smouldering logs and fenceposts, before the fire was finally declared out on 20 January. Some 52,000 stock had to be agisted elsewhere in SA following the fires. Sheep producers who lost stock in the fire were offered discount stock or loaned animals with similar bloodlines by the SA Merino Sheepbreeders Association to help rebuild flocks. The South Australian Police Commissioner declared the fires a major emergency on Wednesday, opening the way to emergency funding for aid and recovery. At least $6m has been pledged by the SA Government. A recovery committee has been formed to deal with longer term recovery. A lengthy and complex coronial enquiry into the fire and the deaths it caused is likely to produce more detail on the unusual aspects of this major fire. A fire was reported shortly after 1pm burning in grass and scrub near Mt Osmond in Adelaide's southeast at the foot of the Adelaide Hills. In sweltering, blustery conditions, the fire jumped a six-lane expressway and rapidly escalated from a small grass fire into a major threat. Over 400 firefighters, assisted by water-bombers, battled the blaze, which had the potential to threaten many properties and lives. Fortunately, as the fire travelled SE into the Leawood Gardens area and to the Eagle on the Hill region, the asset protection strategies of the fire crews resulted in only six houses being slightly damaged. The South Eastern Freeway was closed to allow emergency services vehicles clear access, and some Mt Osmond residents were evacuated. The fire is believed to have been deliberately lit. Also in the Hills, a scrub fire at Mt Bold Reservoir burnt 50ha but was contained by CFS crews within an hour of it starting shortly after 1pm. Another fire near Hallett Cove, an outer southern suburb of Adelaide, closed the Lonsdale Highway. Fires were also reported in the state's Southeast, but were controlled by water-bombing aircraft. The day was one of the hottest for decades in the Southeast, with Coonawarra, which has 20 years of record, experiencing its hottest day on record. A fire that started today 11km north of Balmoral, 60km NW of Hamilton, burnt through 12,041 hectares (120 square kilometres) before being brought under control on Friday 14 January. As of Thursday 13 January, more than 600 firefighters, supported by 130 tankers, bulldozers and 12 aircraft battled the blaze. The fire burnt through both private land and the Black Range State Park, destroying a house, a shed and a car at Telangetuk East, and about 6,000 sheep and several hundred kilometres of fencing on 12 properties. A 40km section of the Henty Highway, between Woohlpooer and Brimpaen, was closed to traffic today and did not reopen until Wednesday. The fire is thought to have started from an unattended campfire. A second large blaze burnt through about 6,000ha of farmland 60km WSW of Ballarat. Strong winds and 40 degree temperatures spread the fire from 3km south of Carranballac to 10km north of Derrinallum. 450 CFA firefighters with 90 trucks and four aircraft fought the fire. A southwesterly wind change that moved through the area late evening threatened to spread the eastern flank of the fire into Skipton and Mingay, however the fire was contained. Thick smoke closed the Hamilton Highway at Darlington and Lismore. A helicopter and 70 firefighers rapidly brought under control a fire that started about 4pm in Rokeby, about 10km E of Hobart. Strong winds spotted the fire in Rokeby and Tranmere threatening the fencelines of several houses, but Tasmania Fire Service personnel were able to control the spot fires. Gusty winds brought down trees on powerlines in Melbourne today, cutting power to nearly 3,000 homes. A tree that fell on powerlines in North Balwyn just before noon cut power to 1,900 properties in Balwyn, North Balwyn and Kew, while a second fallen tree cut power at 1.20pm to 900 residences in Armadale, Malvern and Toorak. 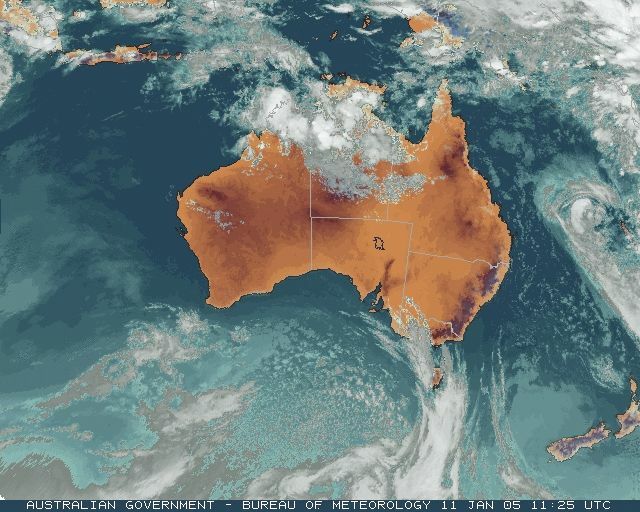 A westward-moving low in the monsoon trough south of Darwin brought torrential rain and heavy electrical activity to the city and surrounds overnight and today. 131.2mm was recorded at the Botanical Gardens for the 24 hours to 9am, and other heavy totals are given in wettest and downpours below. These records are as received at 1134 EST on 05/02/2006. Help in interpreting these statistics and information on quality control is here. Data is as received at 20:06EST, 14/05/2012.